In Phenyx, we constantly focus on details, explore better production techniques, and utilize sturdy material to build our products. We are determined to offer better and easier solutions for sound performance and provide our customers with high-end value without overpaying. Phenyx Pro PTX-10 USB Mixer is a 4-Channel 4-Input USB mixer designed for home recording. Want to record a song via computer and Garageband? Get a solo gig at the local coffee ship? With the mixing console including phantom power as an option, balanced line inputs, XLR input, 3-band EQ, built-in effects section, USB to computer connection, PTX-10 is optimally equipped for live and studio application. *Easy to charge with 5V/400mA USB jack. 4-CHANNEL 4-INPUT: This audio mixer has 4 input channels, including XLR and unbalanced 1/4'' input with +48V Phantom Power, 6.5mm and 3.5mm input jacks for microphone/headset, or high-impedance for guitar/bass. LED peak level indicator and ultra-musical 3-band EQ on channel 1. Easy-to-use interface with all the functions you need for home recording. 3-BAND EQ AND BUILT-IN EFFECTS: Built-in high quality digital effects adds personality to your mix by processing the sound input from Channel 1 with DELAY, LEVEL, and MUTE effects. This audio mixer features volume , pan, and 3-band EQ controls that enable easy and accurate adjustments to your music. 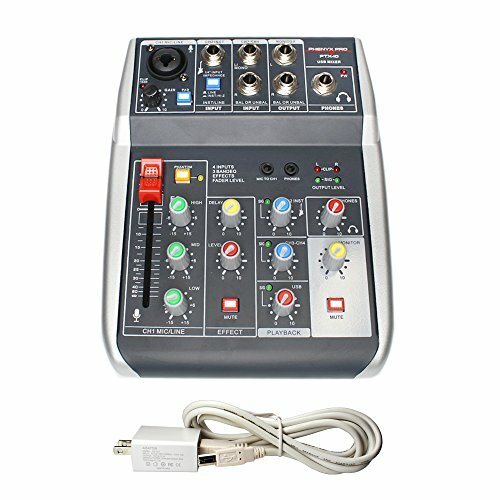 USB AUDIO INTERFACE AND VERSATILE USE: Built-in USB recording interface with connectivity to computer/laptop, easy to plug in to record or process music in your computer. Can be used with electric guitar or electric bass. Clear sound and reliable performance for home recording, club, DJ, stage, live band, KTV, and YouTube. STURDY BUILT WITH COMPACT SIZE: Compact portable size, light-weight and easy to carry around for small events and live gigs. This sturdy built audio mixer aims to be endurable for long-term and heavy use. It is easy to power on using the adapter or plug into your computer with the USB port. DEVOTED CUSTOMER SERVICE: Genuine Phenyx Pro audio products come with 1-Year Warranty & Supportive Customer Service. Welcome to come to us for discounted parts or troubleshooting, service@phenyxusa.com. If you have any questions about this product by Phenyx Pro, contact us by completing and submitting the form below. If you are looking for a specif part number, please include it with your message.